The world’s housing markets are showing signs of recovery, according to the latest survey of world-wide house price indices prepared by the Global Property Guide. Seven countries have emerged from the house price slump (see below). However, most countries suffered sharp house price falls during the year to end-Q2 2009, so that the general situation remains negative. 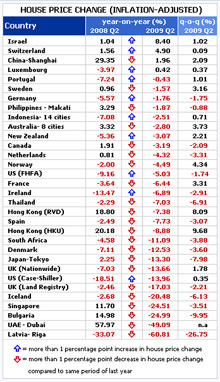 After experiencing declines in 2008, house prices in China, Portugal, Australia, New Zealand, France, Sweden and Hong Kong rebounded during the latest reported quarter, Q2 2009. In Shanghai, China, house prices were up 1.96% during the year to end-Q2 2009. These gains occurred entirely during Q2 2009, when Shanghai’s house prices rose 2.09%. China’s house prices started falling in the last quarter of 2008, but a strong increase in government spending revived both the housing market and the economy, which has seen 7.1% GDP growth during the first half of 2009. Chinese property prices are now widely expected to increase further. Average house prices in the Algarve, Portugal, at €1,429 per square metre, were up by 2% during Q2 2009. House prices in Portugal as a whole rose 1.01% during Q2, and were down only 0.43% on the year to end-Q2 2009, compared to -7.24% during the year to end-Q2 2008. New construction orders in Portugal increased 12.3% during Q2 2009. Australia and New Zealand saw house price increases of 3.73% and 3.31% respectively during Q2 2009. All regional capital cities in Australia registered quarterly house price increases, ranging from 2% to 5%. However, over the year to Q2 2009, there was a price decline of 2.80% in Australia. In New Zealand, the annual change is still negative at -3.07% in the year to end-Q2 2009. But in July 2009, New Zealand had the first yearly house price increase since 2008. After falling for the last five quarters, house prices in France were up by 3.31% during Q2 2009, thanks to government subsidies. In Sweden, house prices were up by 3.16% during Q2 2009. Hong Kong’s house prices increased by an average of 8.9% during Q2 2009. The Case-Shiller house price index was up 0.35% during Q2 2009, from a decline 6.46% during the previous quarter, Q1 2009. Over the year to end-Q2 2009, house prices were down by 13.96%, an improvement from 18.51% fall year-on-year to Q1 2009. The FHFA’s purchase-only index was however down by 1.74% during Q2 2009, somewhat worse than the 0.04% drop during Q1 2009, so the signals in the US are mixed.Over the year ending in the second quarter of 2009, seasonally-adjusted prices fell 5.03%.This was a lesser fall than in the year to end-Q1 (-9.16%) and than in the year to end Q4 2008 (-9.69%) (all figures inflation-adjusted). Israel’s housing market has continued to sail through the global recession. The average price of houses rose 8.40% year-on-year to end-Q2 2009. But the quarterly increase in Q2 2009 was down to 1.02%, a drop from 5.52% in Q1 2009. Switzerland saw an increase of 4.90% over the year to end-Q2 2009. However, house prices barely increased during Q2 2009. A key indicator of improvement is the market’s momentum, i.e., the number of countries that did better this year, than during the previous year. Nine countries improved their year-on-year performance to end Q2-2009, compared with the previous year. In contrast during the year to end-Q1 2009, only six countries did better than the previous year. The Latvian housing market continues its extraordinary decline. Riga, the capital city, saw the average price of standard-type apartments drop 60.81% (inflation-adjusted) during the year to end-1H 2009. Prices dropped 26.75% during Q2 2009. Demand for houses and apartments has been affected by high interest rates, which in June 2009 stood at 17.72% for credits to households. Residential construction has been dismal since 2008, but in Q2 2009, the value of housing construction plunged 71.6% in comparison to the previous quarter. Latvia’s overall economy shrank 18% y-o-y to Q1 2009, and its recession is predicted to continue until 2010. The house price index for Dubai, UAE, fell 49.9% during the year to end-Q2 2009. But quarterly data indicates that Dubai’s downward house price spiral is moderating. House prices fell 8.92% in Q2 2009, much less than the 42% drop in Q1 2009. The International Monetary Fund has declared that global recovery has started. The three big economies of Japan, France and Germany have recently exited from recession. The emerging economies of Asia have revived, with China leading the pack. Whether this recovery will be sustained is the big question.